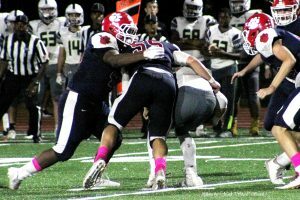 A momentum changing bounce of the football killed hopes of a fourth quarter rally by the Dunwoody Wildcats in a 35-13 Region 7-6A loss to the Northview Titans at North DeKalb Stadium on Friday night. The Wildcats (2-3, 0-3) trailing 21-7 put together a big scoring drive late in the third quarter to gain some momentum following a Colton McDaniel sneak for a Northview (1-4, 1-2) touchdown and a two-score lead. Dunwoody converted a big fourth and three at the Titans’ 34-yard line with a six-yard pass from Zac Pankey to Jack Hogan to keep the drive alive. Rony Martinez made the Titans pay on the very next play going up the middle 28-yards to pull the Wildcats within 21-13 with 10:14 to play. Northview bogged down after getting one first down on the ensuing drive with Wildcat defense getting a gang sack of McDaniel for a loss of eight yards to force a punt and give Dunwoody an opportunity to get the ball back trailing by eight. The punt was short and bounced down the field glancing off a Wildcat player before being recovered by the Titans at the Dunwoody 32. Northview took advantage with William Caylor scoring his second touchdown of the game running it in from three yards out for a 28-13 lead with just 5:02 remaining. The Titans converted a fourth and six play at the Wildcat 28 as McDaniel connected with Caylor on a swing pass that covered 25 yards to the three. Dunwoody was forced to go for a first down on fourth and two at its own 31, but a sack by the Northview defense gave the Titans the football at the 24. Caylor scored on an eight-yard run four plays later to make the final of 35-13. A Pankey to Turner Nims 22-yard pass for a touchdown with 11:52 to play in the second quarter broke a 0-0 tie and gave the Wildcats the early lead of 7-0. Northview answered driving 80 yards with a 39-yard pass play from McDaniel to Zachery Clowe setting up Caylor’s 19-yard scoring run to knot the game at 7-7 with 6:43 left in the first half. The Wildcats defense stiffened late in the first half to force a 34-yard field goal attempt with 32 seconds remaining in the half. Dunwoody blocked the kick to keep the score at 7-7 at the half. Northview opened the second half as McDaniel connected for 50 yards to Clowe to set up the go-ahead score. McDaniel would hit Christian Watson for a five-yard scoring pass to give Northview the lead for good at 14-7. Pankey finished with 134 yards rushing on 12 attempts and threw for 149 yards including a touchdown. 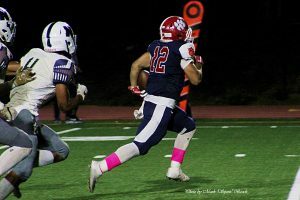 Turner Nims increased his season totals to 21 receptions, 400 yards receiving and three touchdowns as he caught six passes for 124 yards and a touchdown. The Wildcat defense was led Cody Moats with 13 tackles, Jeremiah Collier with 11 tackles and Isaac Anderson with 10 tackles (1 sack). Taurean Taylor picked up his third consecutive 100-yard rushing game with 163 yards and three touchdowns to lead the No. 1 ranked Tucker Tigers to a 54-12 rout of Mundy’s Mill at Twelve Oaks Stadium in Hampton on Friday night. Behind Taylor, the Tigers led 41-0 at the half as David Davis and Darick Stephenson each scored a rushing touchdown and Travon Ford passed to Joshua Vann for another. Stephenson would add another touchdown in the second half and Bryce Spradling would connect with Miles Bowen on a touchdown pass. Tucker improved to 5-1 overall and 3-0 in Region 4-6A to remain in a tie for first place with their DeKalb rivals Stephenson Jaguars. The No. 9 ranked Stephenson Jaguars won their fourth consecutive game with a 27-0 shutout of the Jonesboro Cardinals at Tara Stadium in Jonesboro on Friday night. Deondre Jackson got the Stephenson ground game working in the second half rushing for 58 yards in an 80-yard drive to open the second half, including the final three yards for the touchdown and 13-0 lead as the point after was no good. Stephenson’s defense came up with a big turnover on Jonesboro’s next drive to stop the Cardinals as Ira Henderson stripped a Jonesboro receiver of the football at the Jaguar’s 33. Henderson would finish off the 67-yard drive for the Jaguars with a 19-yard scoring play. Tisdale’s extra point made it 20-0 heading into the fourth quarter. Defensive lineman Darius Perry set up the Jaguars’ final score of the game with a fourth-quarter block of a Cardinals’ punt to set up a touchdown pass by Darren Parker. Parker hit Deshon Stoudemire in the end zone for a 20-yard touchdown pass for the final of 27-0 with Tisdale’s third extra point of the night. Stephenson improved to 4-2 overall and 3-0 in Region 4-6A to remain tied in first with Tucker. Quarterback Gary Tyner threw for two touchdowns and ran for a third in the second half to rally Drew to a 19-12 Region 4-6A victory at Southern Crescent Stadium in Riverdale. The Lions (2-4, 1-2) were in good shape heading into the second half up 12-0, but could not punch in a score in the second half to keep the momentum. A late turnover sealed the fate of the Lakeside Vikings as they fell to Central Gwinnett 38-36 in a shootout at Adams Stadium on Friday night. Lakeside was within three-points at half with Central Gwinnet leading 17-14. Lakeside is 1-5 overall and 0-2 in Region 7-7A action.